FC8600-60 24in, FC8600-75 30in, the FC8600-100 42in, the FC8600-130 54in, the FC8600-160 64in. Maximum compatible media widths for each model are 30", 36", 48", 60", and 72" respectively. 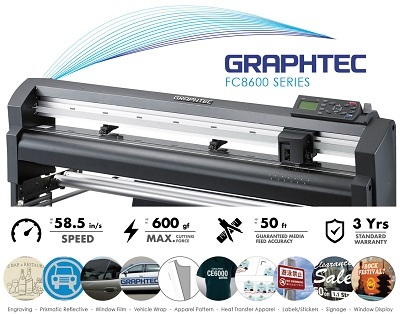 With the world's fastest throughput performance and superb accuracy, the new FC8600 series accommodates the most demanding cutting and plotting projects and provides users with the versatility needed for a wide variety of applications. Mac compatible with systems running OSX 10.4-10.8. *Cannot use Cutting Master with CorelDraw Download (Home) version or Education version since they do not include Visual Basic. Users with these two versions have to contact Corel and upgrade to full versions.